Port Mouton Bay has supported a vibrant commercial fisheries for decades. Generations of fishermen made a living from lobster fishing within the Bay. Today, there are 40 lobster boats operating in the Port Mouton area. Scallops, rock crab, mackerel, irish moss, whelk, and wild salmon can also be found in the Bay. Since the existing fish farm (near Spectacle Island) started operations in 1995, there have been significant changes in the Bay, especially the inner harbour (Spectacle Island to Broad River area). See map of the affected area. A formal survey to these document changes, as observed by fishers and mossers, was completed in January 2007. Review the complete fisher survey results. In May, 2007, “Friends” working with local lobster fishermen completed a detailed lobster catch survey in the Bay. 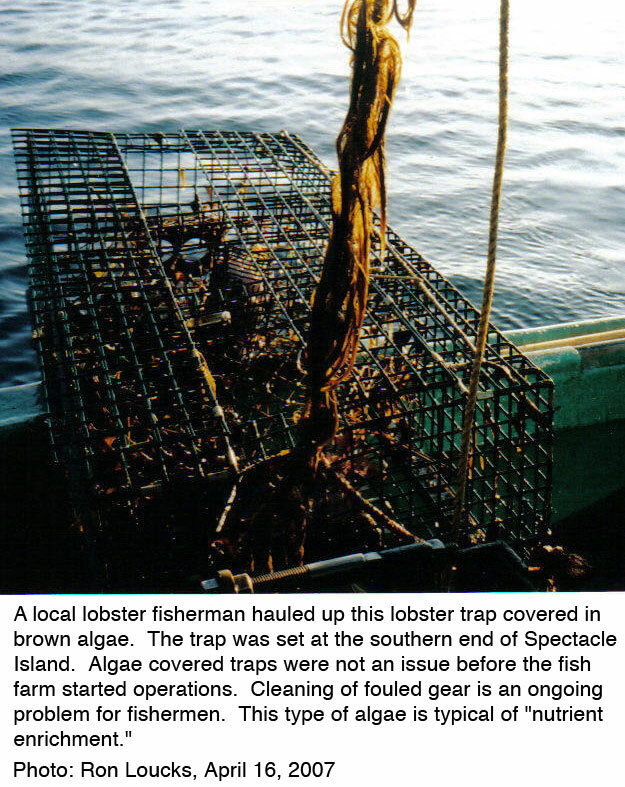 Lobster traps were dropped in five regions in the Bay. Data on catch-per-trap-fishing-day and number of berried female lobster was carefully recorded. Based on analysis of the data, the area near the existing fish farm had considerably lower catch-per-trap-fishing-day and fewer berried lobsters than other regions. In other words, the data confirms our position that the existing fish farm is harming the lobster fishery in the Bay. 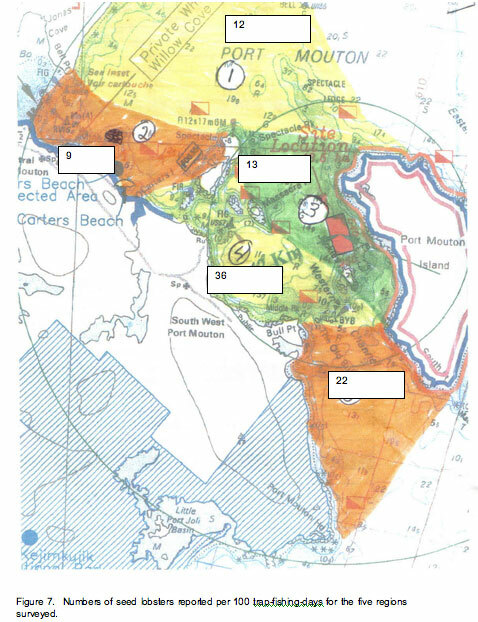 As a followup to the May 2007 lobster trap report (above), “Friends” obtained lobster catch data from DFO. This data includes catches for Port Mouton and nearby areas of Port L'Hebert/Port Joli and Hunts Point. By examining when and where lobster are caught, this data does show that lobster catches have been negatively impacted by the existing farm. Read the report Have Lobster Catches in Port Mouton Increased in Recent Years? (PDF). Lobster trap surveys were also conducted in subsequent years, up to 2011. 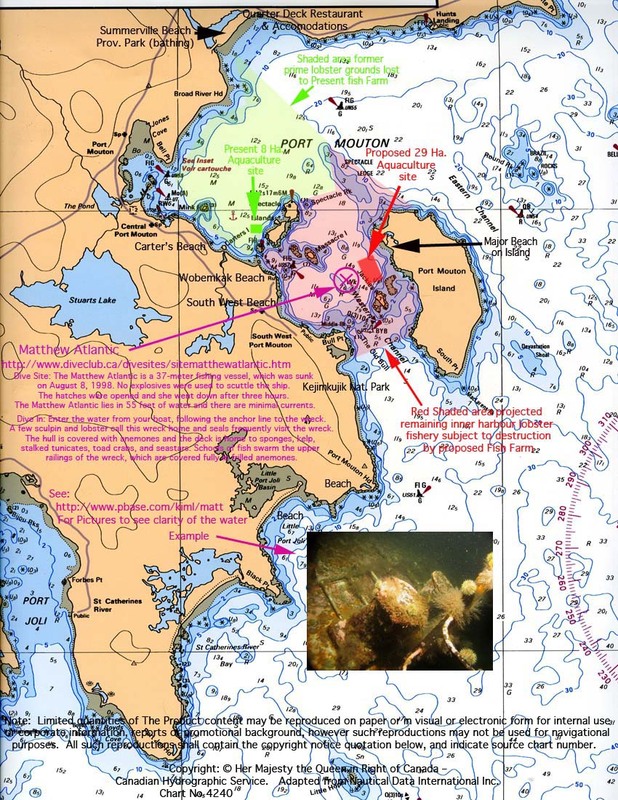 Read the latest report Port Mouton Bay Lobster Trap Survey - covering 2007 to 2011 inclusive. It again demonstrates the continued negative impact of the fish farm near Spectacle Island even though no fish have been actively farmed since July 2009. 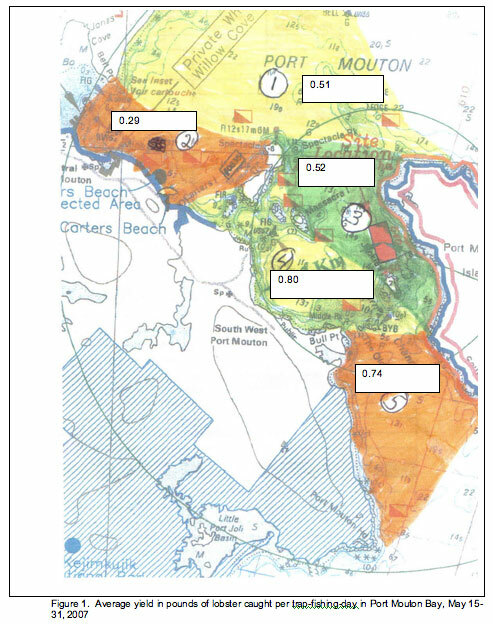 On a positive note, the latest 2011 report also documents signs of recovery in the Bay - notably a smaller degraded lobster habitat zone, and some recovery in kelp, eel grass and Irish moss, mackerel, scallops and rock crab. Lobster fishermen now avoid Spectacle Island and the inner harbour. This area used to be prime lobstering grounds. Our four lobster trap surveys, conducted from 2007 to 2010, all show far fewer lobsters are caught in the inner harbour than in other areas of the Bay. The numbers of rock crab, in the western side of the Bay, have also declined. Rock crab are used as the preferred bait for lobster. Fewer rock crab means finding alternate bait, or purchasing bait. Clams beds on the western shore of Spectacle Island, near the existing site, are affected by algae and foul smells. Deformed clams have been found here. According to Inka Milewski, deformed snouts on clams is a known effect of aquaculture. Mussels on Spectacle Island shorelines have died. In 2002, mounds of dead periwinkles were observed on Spectacle Island shoreline. Irish moss beds no longer flourish in areas near the existing fish farm. Wireweed has killed off moss beds in Summerville, and is spreading. Sludge has killed moss beds on Spectacle Island harbour to the cove used to access the Coast Guard Lighthouse. Mossers have had to find alternate beds to harvest. Recreational scalloping has dropped sharply in the inner harbour. Setting lobster traps outside the Bay means travelling further, and incurring more expenses, and added risk that comes with fishing outside the protection of the Bay. The effect of the existing farm, on the inner harbour has been so pronounced, fishers refer to that area as the “dead zone”. When a second salmon site was proposed for the western side of the Bay, just off Port Mouton Island, the community became gravely concerned. A second, much larger fish farm, would have had an even more profound impact on commercial fisheries. That area of the Bay was an integral (even critcal) part of the Bay's marine ecosystem. Prior to 1995, there was an active ground fishery which continued after the lobster season closed in May. From June to November, gill nets were set to catch haddock, pollock, halibut, etc. The area of the proposed fish farm was fished, and also used as a “safe haven” during hurricane season. Fishers found many large egg-bearing lobsters (berried lobsters) accidently caught in the gill nets set in the area of the proposed fish farm. Gill net fishermen ceased using this area as a “safe haven” for their nets in hurricane season because so many large moulting and berried female lobsters became entrapped, reflecting their stewardship of the fishery. In the summer, lobsters seek out the smooth bottom and calm waters of the Bay to reproduce. Placing a second fish farm in this area, vital to lobster reproduction, would have had devastating consequences for lobster stocks. Critical habitat for lobster MUST be protected from any possible harmful alteration, disruption or destruction. The Little Hope Herring Roe Fishery takes place each year near Port Mouton. Depending on where the herring spawn, the exact location varies. In the fall of 2006, 44 boats actively fished for herring roe near Port Mouton Island and in inner Port Mouton Bay. A Port Mouton fish plant processed the herring. Once again, a fishery with significant economic benefit to the community and beyond, was put at risk by the proposed fish farm. Read our document Herring Roe Fishery at Port Mouton. Displace the lobster fishers who, in the spring, set lobster traps in this area. Likely cause a further decline in rock crab in the western side of the Bay. And likely cause further declines in clams, mussels, scallops and other marine life. Destroy the moss beds in the western side of the Bay, once again forcing mossers to relocate. The area proposed for a second farm has long be used as a "safe haven" for fishing gear. During storms, fishermen collect gear from outside the harbour, and drop in the protected area west of Port Mouton Island. The western channel can be the only viable channel to access the shelter of inner harbour during storms; especially nor'easters which blow down into the eastern harbour causing rough seas. Lobster landings at Port Mouton wharf are up showing no negative impact Landings at the wharf do not reflect where the lobster were actually caught. Remember the cod fishery. Catches are NOT an indication of a stock's health. Lobsters like fish farms and want to be near them The local fishermen find the opposite to be true. Waste from fish plants in the Bay has caused the decline to inner harbour fisheries. Fish plants have operated in the Bay for decades with no harm to the fishery. Solid fish waste is removed from the site. The decline in the inner harbour fishery coincides with the timeline of the fish farm operation. Tides will flush away the waste, so impact on marine life is minor. The existing and proposed sites are “depositional”, that means low currents, and little flushing. See our Environment page for details on Bay currents. The commercial fishery has been the backbone of the Port Mouton area for decades. The arrival of the newcomer, aquaculture, has had a significant negative impact on the commercial fishery. We contend that fish farming in that area of the bay, represented a real threat to lobster reproduction. The potential environmental and economic consequences would have been wide-spread. Economic development should not come at the expense of an existing viable industry.